Hutchison, 22, grew up outside Cincinnati in Mason, Ohio, and he played pretty much everything at Mason High School. Four years of baseball, four years of basketball, two years of football, and one year of hockey. He was All-State in baseball. Despite that, Baseball America (subs. req’d) did not rank Hutchison among the top 500 prospects for the 2015 draft and he went unselected out of high school. Hutchison followed through on his commitment to North Carolina and didn’t see much action as a freshman on the perpetually stacked Tar Heels pitching staff. He allowed 15 runs in 17 mostly mop-up innings his first year with UNC, then he headed to the Coastal Plains League for additional innings during the summer. Hutchison made ten starts and threw 49.2 innings with a 3.44 ERA and more walks (31) than strikeouts (26) for the Holly Springs Salamanders. As a sophomore Hutchison emerged as an important multi-inning reliever with the Tar Heels, pitching to a 4.14 ERA with 43 strikeouts and 17 walks in 58.2 innings. Thirteen times in 30 relief appearances he went at least two innings. Hutchison spent that summer in the Cape Cod League, where he allowed two runs in 25.1 innings for the Chatham Anglers. Baseball America (subs. req’d) did not rank him among the top 30 prospects in the league, however. This past spring Hutchison worked as a jack of all trades pitcher for UNC. He made ten starts and 13 relief appearances, threw 59 innings, and pitched to a 4.55 ERA with 56 strikeouts and 16 walks. Baseball America (subs. req’d) ranked Hutchison as the 462nd best prospect in the 2018 draft class and the Yankees selected him with their sixth round pick, the 187th overall selection. He signed quickly for a below-slot $197,500 (slot was $247,600). The Yankees sent Hutchison directly to Short Season Staten Island after signing and he posted a 1.97 ERA (3.02 FIP) with very good strikeout (24.4%), walk (4.7%), and ground ball (64.4%) rates in 32 innings. He made six starts and three relief appearances. Hutchison participated in Instructional League after the season despite throwing a career high 91 innings between college and pro ball this season. First things first: Hutchison is Yankees-sized at 6-foot-5 and 225 pounds. The Yankees love big pitchers and Hutchison is a big dude. He spent the 2016-17 seasons throwing 90-92 mph at UNC before living in the 93-95 mph range this spring, even touching 96-98 mph at times. Hutchison slings the ball from a low arm slot, almost sidearm, and that gives his fastball quite a bit of movement back in on righties. At UNC, Hutchison’s best secondary pitch was a diving mid-80s changeup that helps him to neutralize lefties. His mid-80s slider improved this spring and again in pro ball this summer, so, at his very best, he goes to the mound with a fastball that runs all over the place and two putaway secondaries in his changeup and slider. Also, Hutchison likes to change up his tempo and delivery to mess with hitters. Here’s a good clip. He can’t be a comfortable at-bat for right-handed hitters.
? The downside with Hutchison is that his command is not great and his control can come and go even though his walk rate with Staten Island this summer didn’t show it. Hutchison’s strike-throwing inconsistencies are at least partly to blame on his arm slot and various deliveries. It’s hard to throw strikes from that arm slot and his mechanics are unrefined because he’s always changing them. The Yankees didn’t let Hutchison vary his delivery (much) this summer and I don’t know whether that’s temporary or permanent. Anyway, Hutchison is a big guy and he’s athletic, plus he’s drawn praise for being coachable and low maintenance. He works quickly on the mound and just plows ahead, going about his business. A coach’s and broadcaster’s dream. Hutchison’s raw stuff is quite good. Developing some consistent strike-throwing ability is the top priority going forward. After three years at a major college program, Hutchison is more than ready for full season ball next year. The Yankees are loaded with lower level pitching prospects and there are only so many rotation spots to go around, so my guess is Hutchison will open next year as a swingman/multi-inning reliever with either Low-A Charleston or High-A Tampa. I expect him to pitch in Tampa at some point next year, even if he opens the season in Charleston. Working on a set schedule in that multi-inning relief role should stretch him out to 120-130 innings next season. I’m a big Rodney Hutchison fan. I am pro-fun and he seems like a fun pitcher with the arm slot and the funky deliveries and all that. The fact he throws a moving fastball and has a chance for two very good secondary pitches is icing on the cake. I’m not sure Hutchison can start long-term with that arm slot — how many righty starters do you see releasing the ball from that far down? — but turning a below slot signing bonus in the sixth round into a big league righty reliever would be a very nice outcome. I’m a fan. Hutchison’s a neat little prospect. It has been a crazy few years in the farm system. The Yankees had a middle of the pack system on Opening Day 2016. By the end of that season it was arguably the best farm system in the game, mostly because of the team’s trade deadline sell-off, but also because several guys who were already in the system broke out. Since the end of the 2016 season, that strong farm system has provided a steady pipeline of talent to the Bronx. The farm system now is not what the farm system was then because of graduations and trades (and injuries and poor performances), which is what we all expected. If you have great prospects, you want them to become great big leaguers and leave the farm system behind. That is exactly what’s happened for the Yankees. The system is back to being middle of the pack now, maybe even worse, and for all the right reasons. Let’s review the year that was down in the minors. The last two seasons (two and a half, really) have been incredible in terms of graduating prospects from the farm system to the big leagues. Gary Sanchez arrived in 2016. Last year it was Aaron Judge, Jordan Montgomery, and Chad Green. This season the Yankees graduated 3B Miguel Andujar (season review) and IF Gleyber Torres (season review) to the big leagues, and they finished second and third in the AL Rookie of the Year voting, respectively. They came into the season as the top two position player prospects in the farm system. Also graduating to MLB this year were RHP Jonathan Holder (season review), RHP Domingo German (season review), and IF Tyler Wade (season review). Wade actually exhausted his rookie eligibility last season through service time, but it wasn’t until this year that he exceeded the 130 at-bat rookie limit. Four of my preseason top 30 Yankees prospects joined the Yankees and exhausted their rookie eligibility this season. (Five of the top ten and six of the top 13 on my 2017 list have since graduated to the Yankees.) As a result, the Yankees had the fourth highest rookie WAR in baseball in 2018. Up until two and a half weeks ago, the Yankees’ top prospect was LHP Justus Sheffield (season review), who pitched well with Triple-A Scranton this season and struggled during his brief MLB cameo. The Yankees cashed him in as a trade chip last month to land James Paxton, who is essentially what we all hoped Sheffield would one day become. Sheffield still has work to do with his command and that made it unlikely he would contribute to the Yankees as a starter in a significant way in 2019. It also made it easier for the win now Yankees to trade him. With Sheffield traded the new top prospect in the organization is OF Estevan Florial and almost by default too. All those graduations and trades the last two years have thinned the farm system considerably. That is the cost of doing business. You can either have a great farm system or a great big league team. Having both at the same time is damn near impossible nowadays with the draft and international free agency spending restrictions. I will happily live with a thinned out farm system while the Yankees field a 100-win team in the Bronx. Anyway, Florial had a difficult season in 2018. He started the year with High-A Tampa, hit .246/.353/.343 (107 wRC+) with one home run in his first 36 games, then went down with wrist surgery. Hamate bone removal sidelined him for seven weeks. Florial wrecked the rookie Gulf Coast League during his rehab assignment (.548/.600/1.000 in nine games), then managed a .263/.355/.375 (112 wRC+) line with two homers in his final 39 games with Tampa. Florial hit a weak .178/.294/.260 in 21 Arizona Fall League games after the season. Florial also improved his walk rate as well, going from 10.5% walks in 2017 to 13.0% walks in 2018, but that doesn’t do much for me. Minor league walk rates are fickle, especially in Single-A ball, where most pitchers are control-challenged. Moving up a level and shaving more than six percentage points off your strikeout rate is not nothing though. Contact is Florial’s biggest weakness — he is a four-tool player and the one tool he lacks is the hit tool, and that is a tantalizing profile with a high bust rate — and hopefully those contact gains this year are real. It was a good year for pitching prospects in the farm system. The Yankees don’t have a future ace in the system — there are only a handful of those guys in the minors — but they are loaded with potential starters and depth arms, among them RHP Jonathan Loaisiga (season review). Many of those pitching prospects took a step forward this season and cemented themselves as legitimate big league prospects who may not be more than a year or two away from the show. Statistically, the biggest breakout prospect in the system this year was RHP Mike King, who came over from the Marlins in last winter’s Caleb Smith/Garrett Cooper roster shuffle trade. King rose three levels this season and finished the year with Triple-A Scranton, posting a 1.79 ERA (2.76 FIP) with 24.4% strikeouts and 4.7% walks in a whopping 161.1 innings. King is a fastball command guy whose secondary stuff is good but not great, so he’s a stats before scouting report prospect. Still, have that much success and reach Triple-A, and you’re on the big league radar. To me, the biggest breakout prospect in the farm system this year was RHP Deivi Garcia. The 19-year-old came into the season as a classic live arm/bad control prospect and suddenly he started throwing strikes. In 14 starts and 74 innings, mostly in Single-A but also one Double-A spot start, Garcia pitched to a 2.55 ERA (2.60 FIP) with 35.5% strikeouts and 6.8% walks. That is the fifth highest strikeout rate and fourth highest K-BB% rate among the 902 pitchers to throw at least 70 innings in the minors this year, and the best marks among teenagers. Garcia is not the biggest guy at 5-foot-10 and 163 lbs., though he still has room to grow, and even if he can’t handle a starter’s workload long-term, his fastball/curveball combination is plenty good enough for the bullpen. He’s a high spin rate guy — the curveball has reportedly been clocked at 3,000+ rpm and that is super duper elite — and his changeup is better than you’d think. Garcia figuring out how to throw strikes this season is really exciting. This was his breakout year in the organization. Next season might be his breakout year on the global prospect map. One of my favorite prospects in the system is RHP Roansy Contreras, a just turned 19-year-old kid who more than held his own when pushed to Low-A Charleston late in the season. Contreras had a 2.42 ERA (3.70 FIP) with 24.0% strikeouts and 8.4% walks in 12 starts and 63.1 innings this season, mostly with the RiverDogs but also some with Short Season Staten Island. A teenager with three quality pitches (fastball, curveball, changeup) and command and pitching know-how deserves more prospect love. Roansy has a chance to be awfully good.
? RHP Trevor Stephan and RHP Garrett Whitlock, two 2017 draftees, carved up Single-A hitters this summer and reached Double-A. Stephan had a 3.69 ERA (3.60 FIP) with 26.8% strikeouts and 7.3% walks in 124.1 total innings this year. He’s a stuff guy with mid-90s gas and a hard slider. Whitlock is more of a pitchability guy with four pitches (four-seamer, sinker, slider, changeup). He had a 1.86 ERA (3.01 FIP) with 24.9% strikeouts and 8.4% walks in 120.2 innings this year. King and Whitlock had the second lowest and fourth lowest ERAs, respectively, among the 510 pitchers to throw at least 100 innings in the minors this year. Thanks to some mechanical tweaks IF Brandon Wagner swatted 21 home runs this season after hitting 19 total from 2015-17. His ground ball rates the last four years: 51.4%, 46.5%, 45.5%, 35.6%. Hmmm. Wagner was far better with High-A Tampa (.270/.376/.510 and 154 wRC+) than Double-A Trenton (.262/.290/.346 and 116 wRC+) this year, but he’s a left-handed hitter with some thump who can play first, third, and a little second. The Yankees rolled the dice and left him unprotected in the Rule 5 Draft, which I don’t think is a big deal. Even if he gets picked, he’ll probably come back. I’m curious to see whether the power and air ball tendencies stick this year. The Yankees spent a lot of money during the 2017-18 international signing period — they had some cash to spend after getting spurned by Shohei Ohtani — and they brought many of those 2017-18 international signees stateside this past season. Usually these kids spend a year cutting their teeth in the Dominican Summer League, even the high-profile ones, but not this year. The Yankees had many of them make their pro debuts in the rookie Gulf Coast and Appalachian Leagues. That’s quite a jump. OF Everson Pereira received a $1.5M bonus last July and the Yankees sent him right to Rookie Pulaski, where he hit .263/.322/.389 (88 wRC+) with three homers and a 32.8% strikeout rate in 41 games. The numbers are not good, obviously, but he was essentially a high school junior playing against college kids fresh out of the draft. “He doesn’t have any 70- or 80-grade tools, but some scouts were confident enough to put future plus grades on his hit, run and raw power already. They also saw a (plus) defender in center field,” said a recent Baseball America scouting report. Periera may be a year way from top 100 prospect status. The Yankees gave OF Antonio Cabello a $1.35M bonus with their leftover Ohtani money and they immediately moved him from catcher to center field. He’s a very good runner and a good athlete, and he was rough behind the plate defensively, so it made sense to move him to center. He can be an asset out there and the bat will be ready long before his defense at catcher. Cabello hit .308/.427/.522 (168 wRC+) with five homers, a 20.8% strikeout rate, and a 14.8% walk rate in 46 GCL games, and his hitting acumen has drawn Vlad Guerrero Jr. and Juan Soto comparisons. Huh. Cabello dislocated his non-throwing shoulder diving for a ball late in the season and needed surgery, but he’s expected back early next year. Bummer, but the tools are incredibly exciting. OF Raimfer Salinas received $1.85M in leftover Ohtani money last year and he’s more tooled up than Cabello. He’s a standout defensive center fielder with excellent bat speed and power potential from the right side. Salinas played only eleven GCL games this year because he damaged a finger ligament on a slide, but he’ll be ready to go next year. 2B Ezequiel Duran signed for a mere $10,000 last July and he stunk with Pulaski this year, hitting .201/.251/.311 (48 wRC+) with a 27.7% strikeout rate in 53 games, but he’s an exit velocity monster who’s been praised for his innate hitting ability. Duran wouldn’t be the first guy to figure it out after a poor pro debut. OF Anthony Garcia ($500,000 bonus) is built like a tank (6-foot-5 and 204 lbs.) and he led the GCL with ten homers in only 44 games this summer. He also struck out in 40.6% (!) of his plate appearances, but a switch-hitter with this kind of power? That’s worth a $500,000 roll of the dice all day, every day. SS Roberto Chirinos ($900,000) is a slick-fielding shortstop with good bat-to-ball skills. He got the bat knocked out of his hands a bit in the GCL though (.238/.289/.337 and 79 wRC+). Pereira and Salinas are 17. Cabello, Garcia, and Chirinos all recently turned 18. Duran is 19. These dudes are the next wave of top prospects, especially Pereira, Cabello, and Salinas. The Yankees had an active trade deadline this year and, more recently, they used Sheffield as the headliner in the Paxton trade. Also sent to Seattle were RHP Erik Swanson and OF Dom Thompson-Williams. Swanson had a 3.86 ERA (3.64 FIP) with 26.8% strikeouts and 4.8% walks in 72.1 Triple-A innings this year and he has a classic back-end starter profile as a fastball/slider/changeup guy. Thompson-Williams became a launch angle guy this year and hit .299/.363/.546 (157 wRC+) with 22 homers in 100 Single-A games. He hit six homers from 2016-17. Swanson’s a nice depth arm. I’m curious to see how the launch angle thing works for Thompson-Williams in Double-A this year. Both guys are nice prospects who were expendable to the Yankees. At the actual trade deadline, the Yankees shipped three pitching prospects to the Orioles for Zach Britton: RHP Cody Carroll, LHP Josh Rogers, and RHP Dillon Tate (season reviews). Tate is easily the best prospect of the three and he still has work to do to refine his command. He had a 3.38 ERA (3.78 FIP) before the trade and a 5.75 ERA (4.14 FIP) after the trade, all in the Double-A Eastern League. 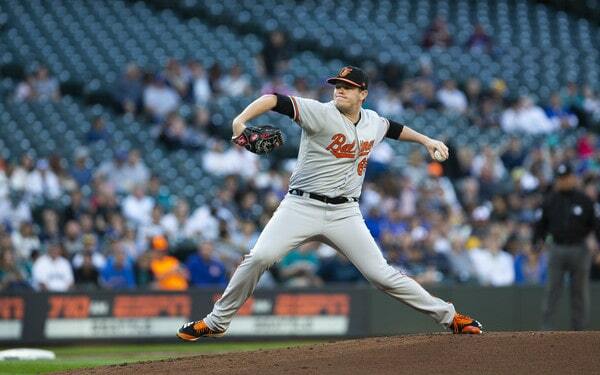 Being a pitcher in need of development in the Orioles system is a bad place to be. Poor Dillon. OF Billy McKinney (season review) was sent to the Blue Jays in the J.A. Happ trade along with Brandon Drury. He hit .226/.299/.495 (120 wRC+) with Triple-A Scranton before the trade while repeating the level. Eh. 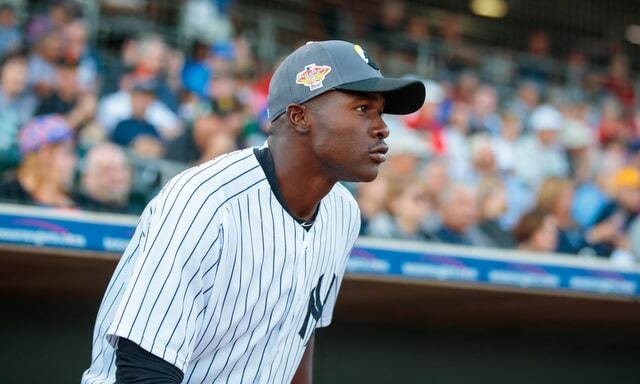 In late August the Yankees used IF Abi Avelino and RHP Juan De Paula to get Andrew McCutchen from the Giants. Avelino bounced between Double-A and Triple-A for the second straight season and hit .287/.333/.446 (117 wRC+) with 15 homers in 123 games before the trade, which represents the best season of his career. Avelino is a classic utility type who went 3-for-11 (.273) as a September call-up with San Francisco. De Paula had a 1.71 ERA (3.46 FIP) with 23.4% strikeouts in 47.1 innings before the trade. He repeated Short Season Staten Island as a 21-year-old, which was kinda weird to me. I get the feeling the Yankees were down on the kid, which probably led to the trade. The Yankees turned longtime organizational arm LHP Caleb Frare into international bonus money in a trade with the White Sox in July. The 25-year-old had a 0.81 ERA (2.23 FIP) with 33.3% strikeouts and 8.6% walks in 44.2 relief innings, almost all at Double-A before the trade, then he struck out nine in seven innings as a September call-up with Chicago. Good for him. Oft-injured RHP Drew Finley went to the Dodgers for Tim Locastro a few weeks ago. Finley’s father works in Los Angeles’ front office, so the trade is something of a homecoming for him. Aside from Tate, the best prospect the Yankees traded at the deadline this year is little known RHP Luis Rijo. He went to the Twins in the Lance Lynn trade with Tyler Austin. The 20-year-old had a 2.77 ERA (2.50 FIP) with 19.5% strikeouts and 1.5% walks in 39 innings before the trade and a 1.27 ERA (3.85 FIP) with 20.5% strikeouts and 4.8% walks in 21.1 innings after the trade, all in short season leagues. Rijo is a fastball/curveball/changeup guy and Baseball America recently said “his tremendous feel for locating the baseball should give him a chance to become a backend starter.” Having a multitude of Luis Rijos in the system to use as trade deadline fodder is an underrated strength of the farm system. The Yankees are loaded with these guys. “Busted” is probably too harsh here, but, as always, several prospects in the system had tough 2018 seasons. There are always going to be injuries and poor performances. That’s baseball. RHP Freicer Perez struggled in six starts with High-A Tampa (21 runs and 19 walks in 25 innings) before having season-ending surgery to remove bone spurs from his shoulder. The good news is his rotator cuff and labrum (and capsule) were not damaged. The bad news is 2018 was a lost season for Perez, one of the better pitching prospects in the system. RHP Albert Abreu, the best right-handed pitching prospect in the system coming into the season, missed more time with elbow problems and posted a 5.20 ERA (4.75 FIP) with 22.7% strikeouts and 9.8% walks in 72.2 innings at mostly High-A. Abreu has really good stuff — it’s an upper-90s fastball with a knockout curveball — but he’s thrown only 126 innings in two years since coming over in the Brian McCann trade, and we’ve yet to see him truly dominant for an extended period of time. Abreu has ability but he’s just kinda spinning his wheels right now. RHP Luis Medina stayed healthy all season but lordy was it bad. The 19-year-old threw 36 innings with Rookie Pulaski and pitched to a 6.25 ERA (6.46 FIP) with 25.5% strikeouts and 25.0% walks. That is 47 strikeouts and 46 walks in 36 innings. Yuuup. Medina’s stuff is electric — it’s a Dellin Betances caliber fastball and breaking ball — and he has the highest ceiling of any pitcher in the organization. But the poor kid has no idea where the ball is going right now. Like Dellin, he’s gonna be a long-term project. The two best middle infield prospects in the organization, SS Thairo Estrada and SS Kyle Holder, had brutal seasons. Estrada got shot during a robbery in January and also battled wrist and back trouble during the season. He was limited to 18 regular season games and had the bullet removed from his hip in June. Thairo did heal up in time to play in the Arizona Fall League. Holder fractured a vertebrae in Spring Training and missed two months, and then missed three weeks with a concussion later in the season. He also went home for two weeks at midseason after his brother passed away. Holder played 48 games this year. 3B Dermis Garcia continued to flash big power (15 homers in 88 Low-A games) and big swing-and-miss issues (30.6% strikeouts), and the Yankees had him throw some bullpen sessions to see how he looked on the mound. Dermis never did appear in a game as a pitcher though. SS Hoy Jun Park had a much better season that you may realize — he hit .258/.387/.349 (122 wRC+) with 18 steals and nearly as many walks (16.2%) as strikeouts (16.4%) in 103 High-A games — but the Yankees are still waiting for the $1.2M bonus kid to take that big step forward developmentally. RHP Chance Adams (season review) underwhelmed while repeating Triple-A (4.78 ERA and 4.87 FIP) and is at something of a career crossroads. Early next season might be his last chance to prove he can hack it as a starter. The Yankees have kept him at arm’s length thus far — his lone big league start was an emergency spot start when Happ went down with hand, foot, and mouth disease. RHP Domingo Acevedo (season review) again battled injuries and was limited to 69.1 innings. Almost exactly one year to the day after being selected in the first round of the 2017 draft, RHP Clarke Schmidt completed his Tommy John surgery rehab and made his pro debut. He managed a 3.09 ERA (2.61 FIP) with 33.0% strikeouts and 6.6% walks in 23.1 closely monitored innings in his return, and by all accounts his stuff looked pretty good. Like his pre-Tommy John surgery stuff, basically. Schmidt’s season came to an end in late August with what has been reported as a non-arm injury. Not sure what’s going on there.
? 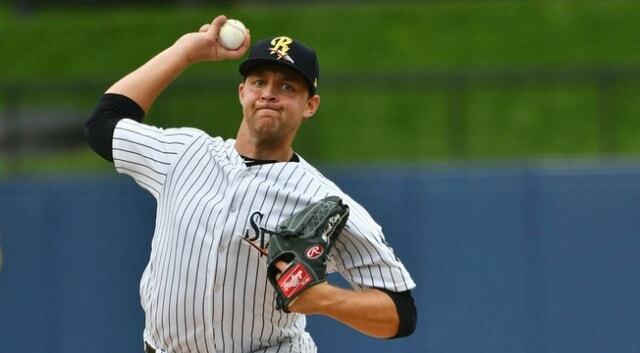 RHP Matt Sauer, last year’s second round pick, had a weird season with Short Season Staten Island, statistically. He threw more strikes than I expected (6.4% walks) and missed way fewer bats than I expected (15.9% strikeouts and 7.1% swings and misses). The Yankees helped Sauer improve his delivery and tempo and it’s possible this year’s statistical weirdness can be attributed to him adjusting to his new mechanics. I dunno. We’ll see what happens next year. RHP Nick Green is one of my favorite prospects in the system. I find him fascinating. He has this funky cutter/sinker hybrid fastball that helped him lead the minors with a 66.4% ground ball rate (min. 130 IP) by nearly five percentage points this season. Green doesn’t have much else to work with aside from the, uh, cut-sinker (? ), but if you’re only going to have one pitch, a dominant ground ball (cut-)sinker is a good pitch to have. Green threw 132.2 innings with a 3.32 ERA (4.28 FIP) with 17.7% strikeouts and 11.1% walks this season, with most of that coming with High-A Tampa. Easy to overlook in the pitching ranks is RHP Nick Nelson, who quietly sits in the mid-to-upper-90s with his fastball and features a hammer power curveball. This season he threw 121.1 innings, mostly at High-A Tampa, with a 3.55 ERA (3.12 FIP) and high walk (12.1%) and strikeout (27.5%) rates. Nelson had the 37th most strikeouts (144) and also the 27th most walks (63) in the minors this year. I’m not sure the control or third pitch will ever be there for him to start long-term. I sure am interested to see what Nelson can do in short one-inning relief bursts though. OF Isiah Gilliam might belong in the “Busted Prospects” section — again, “busted” may be too harsh — after hitting .256/.313/.397 (103 wRC+) with 13 homers in 125 High-A games this year. He had a 137 wRC+ with 21.7% strikeouts and 10.8% walks in Low-A last season. This season it was a 103 wRC+ with 29.0% strikeouts and 6.9% walks in High-A. SS Diego Castillo didn’t hit much with High-A Tampa (.260/.307/.324 and 83 wRC+) but he makes a ton of contact (9.1% strikeouts and 6.1% swings and misses) and can play the hell out of shortstop. I hope the bat catches up to the glove soon. RHP Luis Gil and RHP Juan Then are on opposite ends of the pitching prospect spectrum in terms of style. Gil is a straight grip it and rip it guy who touched 101 mph this season and registers strong spin rates on his curveball. The 20-year-old struck out 68 batters in 46 short season innings this year. He also walked 31. Then, 18, already has three good pitches (fastball, curveball, changeup) and a plan on the mound. The kid is 6-foot-1 and 155 lbs. right now and the Yankees are hoping his low-90s heater becomes a mid-to-upper-90s heater as he matures. Then had a 2.70 ERA (3.22 FIP) with 21.5% strikeouts and 5.6% walks in 50 GCL innings in 2018. RHP Stephen Tarpley (season review) led the minors with a 68.1% ground ball rate (min. 65 IP) this season and earned himself both a September call-up and a spot on the ALDS roster. 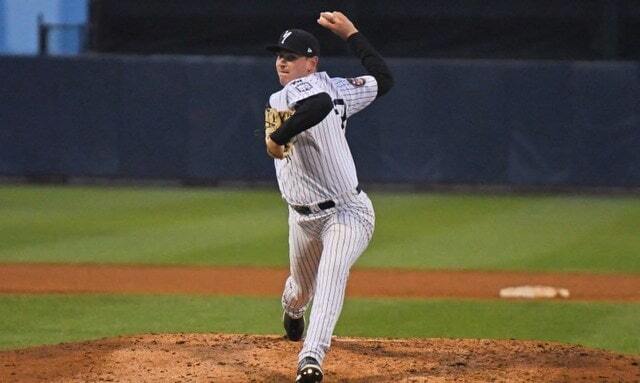 RHP Joe Harvey was untouchable as Triple-A Scranton’s closer this year, pitching to a 1.66 ERA (2.49 FIP) with 28.5% strikeouts and 9.8% walks in 54.1 innings for the RailRiders. The Yankees added him to the 40-man roster to protect him from the Rule 5 Draft last month. We’re going to see these two dudes in the big league bullpen next year, even if they’re only shuttle guys. Last season’s 91-71 record gave the Yankees the 23rd overall pick in the 2018 draft, which they used on C Anthony Seigler (prospect profile). He’s the best prospect the Yankees drafted this year (duh) followed by second rounder C Josh Breaux (prospect profile) and fourth rounder RHP Frank German (prospect profile). Here are my Day One, Day Two, and Day Three draft recaps. Among the late round picks, RHP Rodney Hutchison (sixth round) created some buzz right before the draft because his fastball ticked up and he showed an improved slider. He had a 1.97 ERA (3.02 FIP) with very good strikeout (24.4%), walk (4.7%), and ground ball (64.4%) rates in 32 innings with Short Season Staten Island in his pro debut. RHP Tanner Myatt (11th round) opened some eyes with his 97-99 mph heater and hard slider after turning pro. He struck out 22 in 18.1 mostly rookie ball innings. While the high picks like Seigler and Breaux get all the attention and understandably so — my money is on Seigler being the consensus No. 1 prospect in the system at this time next year — the late rounds are where the Yankees have built their farm system depth. Guys like Rogers (11th), Whitlock (18th round), and Carroll (22nd round) were all unheralded Day Three picks in recent years who developed into solid prospects and, in Rogers’ and Carroll’s case, trade chips. A year from now we might be talking about Hutchison and Myatt as the next late round success stories. The Yankees have more minor leaguers under contract that any other team. That doesn’t necessarily mean they have more prospects. It just means they have more minor leaguers. As J.J. Cooper explained in August, the Yankees have nine minor league affiliates and thus can have roughly 340 players under contract. Most other organizations only have six or seven minor league affiliates, and can carry around 290 contracts. Those extra 50 (!) roster spots mean the Yankees have more innings and at-bats to play with, and more spots for lottery tickets. OF Trey Amburgey: Righty hitter and thrower has some pop and authored an underwhelming .258/.300/.418 (97 wRC+) line with Double-A Trenton this year. SS Oswaldo Cabrera: The tools are all there but the production is not. Cabrera hit .229/.273/.320 (70 wRC+) with a 12.5% strikeout rate with Low-A Charleston this year. RHP Rony Garcia: Cutter specialist reached High-A at age 20 this year and posted solid strikeout (21.0%) and walk (5.5%) rates in 119 innings. Deivi pulled away as the system’s best Garcia though. RHP Yoendrys Gomez: Mid-90s fastball and a rainbow curveball produced a 2.08 ERA (3.57 FIP) and 25.8% strikeouts in 47.2 rookie ball innings this summer. Someone to watch. RHP Nolan Martinez: Finally stayed healthy and threw 61.2 innings with 3.36 ERA (4.19 FIP) this year. He threw 20.2 innings total from 2016-17. Next year will be a big one. OF Pablo Olivares: Personal favorite hit .322/.391/.442 (142 wRC+) in 70 Single-A games before an unknown injury ended his season in July. That’s too bad. RHP Glenn Otto: Last year’s fifth rounder showed a dynamite fastball/curveball combination in his two starts before needing season-ending surgery to treat a blood clot in his shoulder. OF Alex Palma: Built on last year’s breakout with a .299/.348/.459 (132 wRC+) line in 52 High-A games. He suffered a season-ending injury in an outfield collision in July. I’m looking forward to full seasons of Gomez and Martinez next year and I want to see how Olivares, Otto, and Palma rebound from their injuries. Especially Otto and especially especially Olivares. He’s not a star prospect like the stat line would lead you to believe, but he can do everything well. Just a solid all-around ballplayer. Had he not gotten hurt, the 20-year-old Olivares might’ve finished the season in Double-A and been added to the 40-man roster after the season. Instead, the Yankees are gambling no team will take an injured Single-A outfielder in the Rule 5 Draft. As was the case last year, the farm system now is worse than it was in March, and for good reason. The Yankees graduated two high-end prospects to the big leagues in Torres and Andujar, and they used several others in trades, most notably Sheffield and Tate. If the farm system is going to take a hit, you want it to take a hit because guys are graduating and being traded for MLB help, and that’s what happened with the Yankees. Barring a fire sale — the Yankees might get prospects for Sonny Gray but otherwise they aren’t selling veterans anytime soon — it is awfully tough for the Yankees to build a farm system now. They have back of the first round draft picks (30th overall in 2019) and the draft and international spending restrictions level the playing field. The Yankees added some very exciting international kids (Pereira, Cabello) and new draftees (Seigler) to the system this year. It’ll take a year or two before they develop into foundational prospects, however. Fortunately the farm system has already done its part strengthening the MLB team.